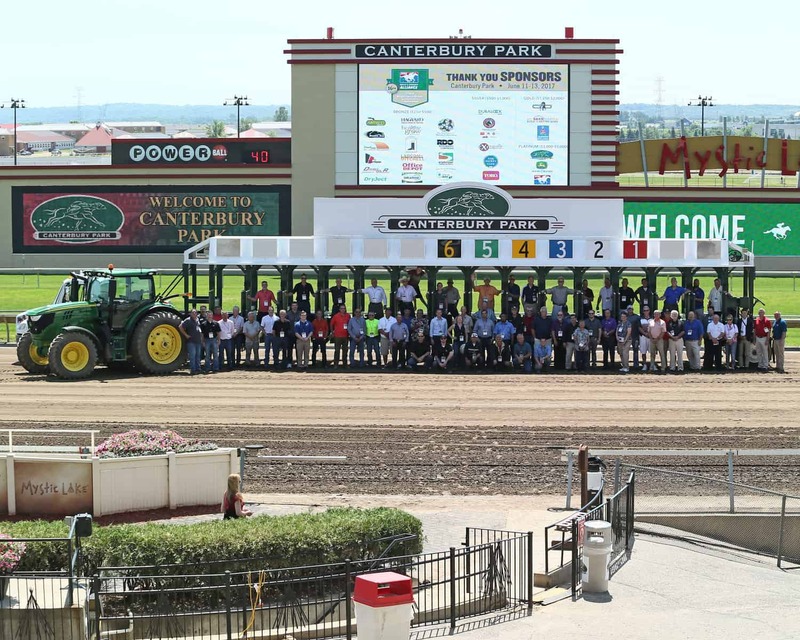 An emphasis on safer and more consistent racing surfaces, aided by science and technology, was heard by a record 120 registrants at the 16th annual Track Superintendents Conference, which wrapped up Tuesday evening at Canterbury Park in Shakopee, Minn., near Minneapolis. Sixteen speakers addressed the gathering – produced by the National Thoroughbred Racing Association (NTRA) – on topics including biosecurity, racetrack geometry, and best-practice turf management. Roberta Dwyer, professor at the University of Kentucky’s Department of Animal & Food Sciences, on the importance of having a plan for biosecurity (procedures intended to protect against disease or harmful biological agents) in place before it’s needed. Peterson on the science behind racetrack geometry, banking, and gradients. Dan Wiese and Blair Scheibel of RDO Integrated Controls with a live demonstration of how to measure slope in a racetrack turn using dual slope lasers. Jockeys’ Guild representative and retired rider Jeff Johnston on best-practice design and installation options for modern race rails, presented with video footage of on-track incidents that illustrate the role rails play in jockey and horse safety. Glen Kozak of the New York Racing Association (NYRA) on the track renovation project now underway at Aqueduct. Sean Gault of Woodbine Entertainment Group reporting on the successful first year of Woodbine’s new Tapeta surface and future investments planned for Woodbine turf racing. Lynn Hovda, chief veterinarian for the Minnesota Racing Commission, on best practices from AAEP’s raceday injury management guidelines, including communication, equipment, planning, and special considerations such as heat stroke and fatalities. Ken Brodbeck of Precision Inflation on the benefits of proper tractor tire inflation, which include a larger footprint on the ground, minimizing compaction, eliminating power hop, lowering maintenance costs, and increasing fuel efficiency. The 120 attendees from around the world (United States and U.S. Virgin Islands, Canada, England, Japan, United Arab Emirates, and Puerto Rico) was a record for the Track Superintendents Conference (originally known as Track Superintendents Field Day and then Track Superintendents and Arena Managers Field Day), which attracted 20 participants for its inaugural event in 2001. The Track Superintendents Conference is sponsored by Canterbury Park, John Deere, Hagyard Equine Medical Institute, The Jockey Club, NTRA, Office Depot, Racing Surfaces Testing Laboratory, and Sherwin-Williams.